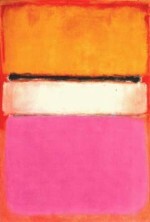 In 1964, a new avant-garde artist was introduced to the art scene in the Swedish city of Gōteborg. The fresh new artist was Pierre Brassau and his work received rave reviews from critics and art fans alike. Brassau featured four paintings in the 1964 exhibition at Gallerie Christinae, and even sold one “masterpiece” to a collector named Bertil Eklöt for $90 (about $650 today). The exhibition featured paintings from artists across Europe, but it was the hot new French Artist who stole the show. The opinion was unpopular among the other critics, despite that the pieces of art looking strikingly similar to “art” you commonly see stuck to refrigerators, produced by 2 year olds the world over. It turns out, though, that the “ape” review more or less hit the nail on the head. Pierre Brassau was actually none other than a young West African chimpanzee named Peter who lived in the Borås djurpark zoo in Sweden. The mastermind behind the hoax was journalist Åke “Dacke” Axelsson. Axelsson worked for the Swedish tabloid Gotebors-Tidningen and came up with the idea of featuring the primate paintings in an exhibition in order to put the critics to the test. Could they recognize the work of true avant-garde modern artists? Axelsson convinced Peter’s teenage caretaker to let the chimpanzee play with some oil paints and a brush. Initially, Peter ate more paint than he managed to get onto the canvasses; his favorite “flavor” was cobalt blue, a color which featured prominently in his later work. With some encouragement, Peter soon began to develop his artistic skills. Once he finished showing off his artistic talents, producing several paintings, Axelsson chose the four which he considered the most worthy to be displayed, and set about getting them included in the exhibition at the Gallerie Christinae. Once the hoax was revealed, the critic who had previously compared Pierre Brassau with a ballet dancer, Rolf Anderberg, doggedly stuck by his assessment and stated that Pierre’s work “was still the best painting in the exhibition”. Peter isn’t the only primate to have found success as an artist. In 2005, the director of the State Art Museum of Moritzburg in Saxony-Anhalt, Dr Kajta Schneider, mistakenly identified a painting as the work of Ernst Wilhelm Nay, a Guggenheim Prize winning artist. 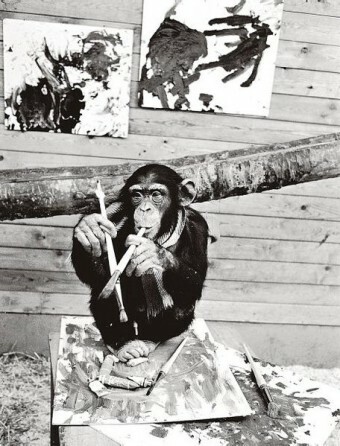 In fact, the painting was done by Banghi who was a chimpanzee living at Halle Zoo. In 2011, Pockets Warhol, a capuchin monkey currently living in a sanctuary in Toronto, had his own art exhibition featuring 40 of his abstract paintings. His paintings have been purchased by people across the globe and sell for as much as $300 each. Proceeds from the sale of his artwork go to helping care for the other residents of the animal sanctuary where he lives. In 2010, Jimmy, a 27 year old chimpanzee living in Rio De Janeiro, earned national acclaim for his artistic talents. When Jimmy’s caretakers realized that he had become depressed, they decided to give him some paints to brighten up his days. Jimmy showed an instant aptitude for art and has since become a household name across Brazil. He even has an art instructor who visits him 3 times a week. In 2009, 3 paintings by Congo the chimpanzee sold at auction for more than $25,000. Congo was born in 1954 and produced around 400 paintings during his life. He died at age 10 of tuberculosis. Pablo Picasso is reported to have been a fan of Congo’s work, and in fact owned one of Congo’s paintings, which hung on his studio wall. According to the New York Times, in 2006 Jackson Pollock’s No. 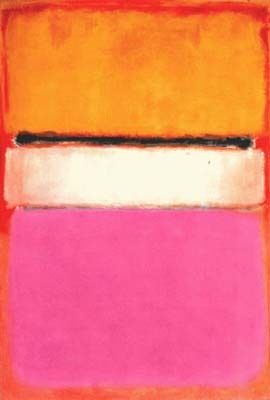 5, 1948 seen to your right below “White Center” sold for $140 million to David Martinez. Martinez later denied the New York Times’ claim and stated he never made such a purchase, but this type of secrecy is not uncommon when one purchases something so valuable and portable. He is still thought to be the owner of the painting. Before Martinez apparently purchased Pollock’s No. 5, 1948, it was owned at the time by famed music producer and businessman, David Geffen. That same year, Geffen also sold three other paintings, one by Dr Kooning and two by Jasper Johns, grossing another $143 million combined bringing in a cool $283 million off selling just 4 paintings in the span of a few months. The most expensive piece of art sold to date is one of the versions of The Card Players, by Paul Cézanne, which sold for somewhere between $250-$320 million to the Royal Family of Qatar, who apparently have too much money on their hands. Qatar is on the Arabian Peninsula and has a population of just 2 million people and only about 250,000 citizens, yet a gross domestic product of about $182 billion, giving it the highest per capita gross domestic product of any country in the world. If you guessed that their little country has a lot of oil, you’d be right. They also have rich supplies of natural gas. Not only is it one of the wealthiest countries in the world per capita, but it also has one of the lowest tax rates, including having no income tax. Ha! This is so awesome. I have a painting my granddaughter did that I’m pretty sure is good enough to be a gallery, but I could be biased. Although that monkey did sell his for $25K, so maybe she has a shot! I don’t think so Nella.